FULLY RECLINABLE WITH DOUBLE LOCK SLIDERS. 2 BLACK CLOTH RACING SEAT. These seats are designed for universal fit. CLOTH- BLACK. 35 lbs each. Breaking down 2006 BMW M5. Front Black Leather Sports Seats. Seat Belts. Unless specified, we do not have the radio codes for the stereo. Radio Code. These are E60 LCI M5 Sport Multifunction 20-Way Adjustable Seats w/ ///M Tri-Fold Headrest - Full Black Marino Leather - from a 2010 BMW M5, well taken care of. Driver side has minor wear. 2004-2007 5 Series E60. All electrical connectors are fully intact. This is a used original BMW part. 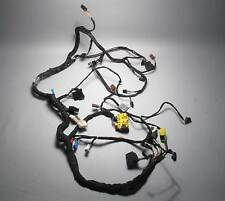 ITEM: left comfort seat wiring harness w Active backrest. From 2008 - To 03/08 M5 Sedan (E60/S85). You have the following seat color options The picture shown is of an installed and used base. Indianapolis Red. Off a 2006 BMW M5 SMG. Vin: WBSNB93506B584322. FULLY RECLINABLE WITH SLIDER. 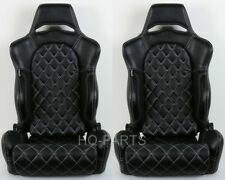 2 BLACK RACING SEAT W/ RED STITCH. PVC Leather- BLACK RED STITCH. These seats are designed for universal fit. 34 lbs EACH. 5 Series E60. The seat has heating, which is tested and working. There are a few scratches near the bottom of the left side seat (right side in the photos), but none of the scratches are serious. Details can be viewed in the photos. FULLY RECLINABLE WITH SLIDER. These seats are designed for universal fit. 2 BLACK / RED RACING SEAT. 1 Pair (1 Right and 1 Left). CLOTH- BLACK RED. 34 lbs EACH. FULLY RECLINABLE WITH DOUBLE LOCK SLIDERS. These seats are designed for universal fit. 2 GRAY & BLACK RACING SEAT. PVC Leather(GRAY Area). Suede(BLACK Area). 34 lbs EACH SEAT. 5 Series E60. All the functions of the seats are tested and working. However, the lower thigh bolsters are disconnected from the drive motor on both seats, so the bolster only slides inwards and outwards manually. 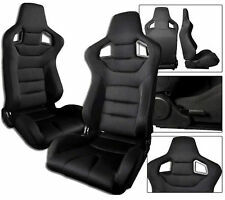 ITEM: rear seat leather, climatized black. 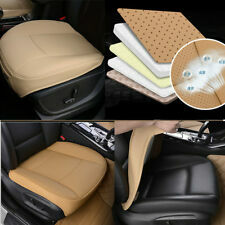 This seat leather is Climatized (Perforated) Black Leather (BMW Upholstery Code: X2SW). The leather is in very good condition. The stitching is tight and all mounting tabs are intact. Breaking down 2007 BMW M5. Right Front Seat Leather Blown Tensioner Cream. Seat Belts. Unless specified, we do not have the radio codes for the stereo. Radio Code. 2004-2007 5 Series E60. Also, there is one dimple in the leather on the left side of the thigh support. This seat pad has heating. Pad does NOT have a seat occupancy sensor, so it can only be used on the LEFT (driver's) side seat. 2 X TANAKA BLACK & SILVER PVC LEATHER RACING SEAT RECLINABLE DOUBLE LOCK SLIDERS & DUAL RECLINER & DIAMOND STITCH. Diamond Stitch. PVC Leather- BLACK & SILVER. FULLY RECLINABLE WITH DOUBLE LOCK SLIDERS & DUAL RECLINER & DIAMOND STITCH. FULLY RECLINABLE WITH DOUBLE LOCK SLIDERS. 2 BLACK & RED RACING SEAT. These seats are designed for universal fit. PVC Leather- BLACK & RED. 34 lbs EACH. FULLY RECLINABLE WITH SLIDER. 2 BLACK PVC LEATHER RACING SEAT. PVC Leather- BLACK. These seats are designed for universal fit. 35 lbs EACH. FULLY RECLINABLE WITH DOUBLE LOCK SLIDERS. 2 BLACK PVC LEATHER RACING SEATS. PVC Leather- BLACK. These seats are designed for universal fit. 34 lbs EACH. FULLY RECLINABLE WITH SLIDER. These seats are designed for universal fit. 2 RED PVC LEATHER RACING SEAT. PVC Leather- RED. 34 lbs EACH SEAT. FULLY RECLINABLE WITH SLIDER. 2 GRAY CLOTH RACING SEATS. CLOTH- GRAY. These seats are designed for universal fit. of using your old hardware(brackets) from the original seats. We do make custom brackets for any model of vehicle. FULLY RECLINABLE WITH SLIDER. 2 BLACK & RED PVC LEATHER RACING SEAT. PVC Leather- BLACK & RED. These seats are designed for universal fit. 35 lbs EACH. Equipped with: Active Seat Width, Lumbar, Heating and Cooling. Seatback and harness fit Driver or Passenger side (seatback was removed from a passenger seat). FULLY RECLINABLE WITH SLIDER. These seats are designed for universal fit. CLOTH- BLACK BLACK STITCH. 2 BLACK / BLACK STITCH RACING SEAT. 34 lbs each seat. FULLY RECLINABLE WITH SLIDER. 2 BLACK / RED STITCH RACING SEAT. CLOTH- BLACK RED STITCH. These seats are designed for universal fit. 34 lbs each. FULLY RECLINABLE WITH SLIDER. 2 RED & BLACK RACING SEAT. These seats are designed for universal fit. PVC Leather(RED Area). Suede(BLACK Area). BODY TYPE: E60. This part is original and genuine from the BMW factory. The parts are in good working condition. Helpful Links. Auto Foreign Parts was established in 2015. 2008 BMW 535xi. 2006 - 2007 BMW 525xi. 2006 - 2010 BMW 550i. 2004 - 2007 BMW 525i. 2008 - 2010 BMW 535i. 2009 - 2010 BMW 535i xDrive. 2006 - 2010 BMW M5. 2008 - 2010 BMW 528i. FULLY RECLINABLE WITH SLIDER. 2 BLACK BLUE STITCH. PVC Leather- BLACK BLUE STITCH. These seats are designed for universal fit. RACING SEAT. 34 lbs EACH SEAT. There is one partially broken mounting tab where the headrest ball joint mounts. The motor is otherwise in excellent condition. It is tested and fully operational. This is a used original BMW part. 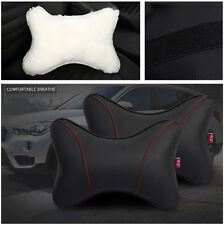 BMW Black Leather Rear Seat Bottom Cushion Base E60. Black Leather Rear Seat Bottom Cushion Base. BMW 3 Series. This is a used Original BMW part. 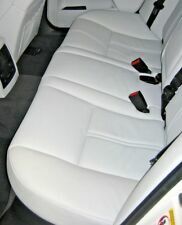 The upholstery is Black Dakota leather, BMW factory upholstery code LCSW. FULLY RECLINABLE WITH SLIDER. NEW 2 BLACK PVC LEATHER W/ CARBON LOOK TRIM RACING SEATS W/ SLIDERS. CENTER ARER: PVC LEATHER- BLACK. CARBON LOOK TRIM and BACK. We do make custom brackets for any model of vehicle. BODY TYPE: E60. This part is original and genuine from the BMW factory. The parts are in good working condition. Auto Foreign Parts was established in 2015. DONOR VEHICLE. FULLY RECLINABLE WITH SLIDER. These seats are designed for universal fit. 2 WHITE & BLACK RACING SEAT. 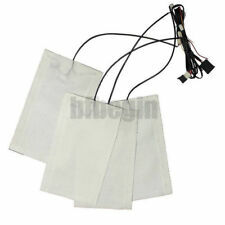 PVC Leather(WHITE Area). Suede(BLACK Area). 34 lbs EACH SEAT. FULLY RECLINABLE WITH SLIDER. 2 BLACK PVC LEATHER RACING SEATS. PVC Leather- BLACK. These seats are designed for universal fit. using your old hardware(brackets) from the original seats. but adaptors (brackets) are not included. FULLY RECLINABLE WITH SLIDER. CLOTH- BLACK YELLOW STITCH. 2 BLACK / YELLOW STITCH RACING SEAT. These seats are designed for universal fit. 34 lbs each seat. FULLY RECLINABLE WITH SLIDER. These seats are designed for universal fit. 2 BLACK / BLUE RACING SEAT. 1 Pair (1 Right and 1 Left). CLOTH- BLACK BLUE. 34 lbs EACH. 5 Series E61. 5 Series E60. These seats were taken from a 2008 535xi sedan. They are Cream Beige Dakota Leather (BMW code LCGE). The left seat has an Occupancy sensor. All functions are tested and working. FULLY RECLINABLE WITH SLIDER. CLOTH- BLACK GRAY. 2 BLACK / GRAY RACING SEAT. These seats are designed for universal fit. using your old hardware(brackets) from the original seats. 1 Pair (1 Right and 1 Left). FULLY RECLINABLE WITH SLIDER. 2 BLACK & RED PVC LEATHER RACING SEATS SLIDERS. PVC Leather- BLACK & RED. These seats are designed for universal fit. using your old hardware(brackets) from the original seats. FULLY RECLINABLE WITH SLIDER. 2 BLACK & GRAY PVC LEATHER RACING SEATS SLIDERS. PVC Leather- BLACK & GRAY. These seats are designed for universal fit. using your old hardware(brackets) from the original seats. 2004-2007 5 Series E60. This motor is mounted on the left side of the back rest on either the left or the right front seat. This is a used original BMW part. Production for the "model year" usually begins in September of the previous calendar year, so if you have a 1995 model BMW it will have been produced anywhere between 9/94 - 8/95. 5 Series E61. 5 Series E60. The upholstery on this seat back is Black Dakota Leather (BMW upholstery code LCSW), and it is in good condition. It fits both left and right front basic style seats. Not for Comfort, Sports, or M Multifunction seats. 2004-2007 5 Series E60. This switch is for the right / passenger front seat. This is a used original BMW part. From 04/07 - 2010 X5 3.0si SAV (E70/N52N). 2007-2010 X5 E70. From 04/07 - 2010 X5 4.8i SAV (E70/N62N). FULLY RECLINABLE WITH SLIDER. These seats are designed for universal fit. 2 YELLOW & BLACK RACING SEAT. PVC Leather(YELLOW Area). Suede(BLACK Area). 34 lbs EACH SEAT.